Today the weather was listed as improving. That was certainly the case. The rain was no longer pouring down. It was still cloudy and gray though, with a biting wind. No worries, I was game. It's all about layering and the right jacket. Right before I headed to NYC I finally found a lined, rain resistant shell in black with hood. It was square cut so that layers would fit easily under it and went down to my mid thigh. It was a blessing. I did make one mistake though. I was shy one layer under the jacket. The temperature was easy to find out, but it was the bite of the wind - wind chill - that I forgot to consider. And I left my neck scarf on the bed. So this day I got COLD! Top of my list today was a walking tour of Greenwich Village offered by Free Tours by Foot. It's billed as two hours, but I think ours lasted a little longer. What I love about these walking tours is that the area is no longer just an interesting set of buildings, streets and shops. As you hear the history of the area it comes alive. I also find the guides at this tour company are excellent as their payment comes as tips at the end of the tour. Give a great tour - get great tips. The motivation for them is high. bus on my last trip. Going to hold onto this secret until my final post! I thought I had planned out my subway route pretty well, but made one mistake. There was a transfer I should have taken to another line that dropped off right beside the starting location. I love to walk so figured I'd just stay on my normal train and stroll through the neighborhood to the starting point. Unfortunately, this is the one part of Manhattan that isn't laid out in numbered grids. The roads twist and turn, change names and head off in new directions at odd angles Luckily I left early (something I strongly suggest any time you're on transit) as I had to stop often, refer to my small street map and ask at least three locals before I found my way to the right spot with only ten minutes to spare. Left - this gated area would have been low income housing. Times have changed. It's now exclusive housing. Centre Bottom - Jefferson Market Public Library which historically was a famous courthouse. Right - The building the Friends cast supposedly lived in. Only used for outside shots. I think I live under a lucky star as the tour guide who arrived was brilliant. I could not have asked for better. Renee Rewiski had both the perfect local accent as well as what I like to call the NYC sense of humour. She charmed me from the moment she arrived. Then the tour began and I was seriously impressed. She had an encyclopedic knowledge of the area's history, geography, immigration, development, buildings of special interest, TV and Film sites, real estate prices and more. Not once did she refer to notes - it just poured out. I came away full of appreciation for the area and actually came back another day to re-walk parts of it and review what I had learned. --Sat. 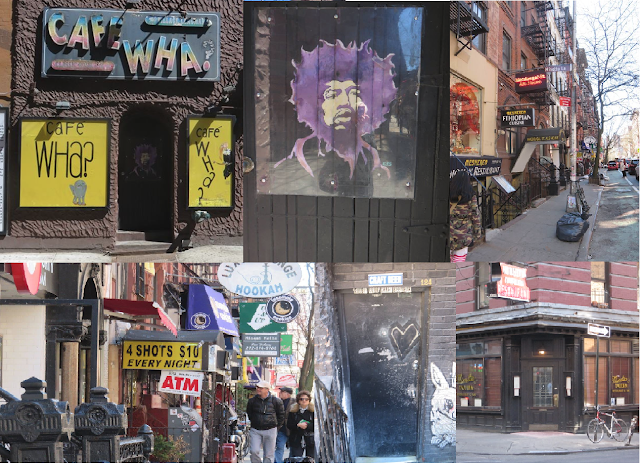 9:45 a.m. Greenwich Village and 2 p.m. SoHo, Little Italy and Chinatown. Pictures were limited today as I didn't realize my camera battery was low. It ran out early in our tour so I switched to a few cell phone pics and shot a few more the day I came back to walk the route again. A few others were snagged from Google Images. There were so many highlights it's hard to remember them all. I've just chosen a few from the large smorgasbord of information shared by Renee. You really need to take her tour to hear it all. --Greenwich is EXPENSIVE. Walking the small side streets, I found them interesting, BUT not luxurious. The people walking the streets seem pretty normal and I didn't notice tons of expensive cars or clothing. A few of the homes had paint peeling on the window frames. That must be part of the expected ambiance as Renee shared what residence after residence had last sold for and it was mind boggling. This is one of the few areas that still have single family homes and they are going for record prices. 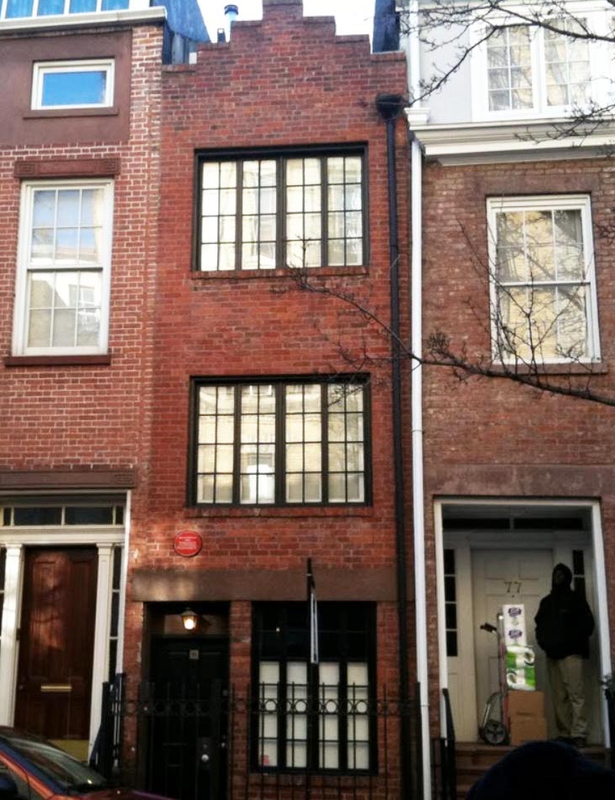 --Narrowest house in NYC is at 75 1/2 Bedford Street. It's only 9-1/2 feet wide and 30 feet deep. 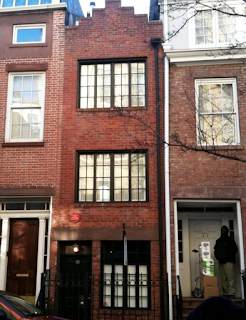 It was originally an alley, but as prices soared in Greenwich, this house was built in the narrow open space. The last time it sold, it went for $3.25 million, but I found a new listing after that for $4.3 million. Don't know if it sold for that price or not You can read more HERE. --Early immigrants created more space by using landfill to build up the area. You can see the original shape of Manhattan in the image below. The yellow outline shows the area created through landfill. The number I remember was something like 30% of Manhattan is built on landfill, but I would need to verify that number as I heard so many facts on this tour it's hard to remember them all exactly. --Why are the houses built above the height of the road with stairs up as well as a gate leading to a second entrance underneath the stairs? There was so little room, this is how the rich dealt with creating a servants' entrance. The servants entered the house through the lower door. At the gate down is an arched piece of metal to scrape your boots clean. As horses were the main form of transportation at the time, the manure piled high along the streets and clung to shoes. In summer it dried out and became dusty, adding to the air pollution. --C.O. Bigelow Apothecaries is one of the oldest pharmacies in the North America. It was founded in 1838. I love that they didn't change the name to pharmacy or drugstore and that they kept some of the vintage flavour of the building inside the store. 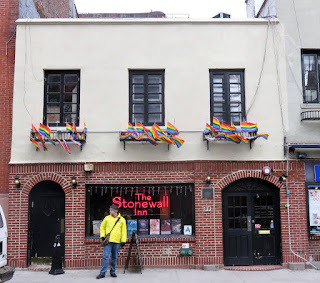 --Located on Christopher Street, the Stonewall Inn has a very long history. 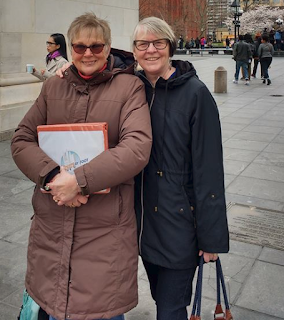 The most important event is that it was the site of the 1969 Gay Riots, aka the Gay Rebellion or the Stonewall Riots. A year after, the very first pride parade was held, but it was initially called Christopher Street Day and it is still called that in some parts of the world. "The Mafia-run bar had a colorful reputation and drew patrons across the Gay community, including Drag Queens, effeminate young men, and homeless youths. Members of the Gay and lesbian community had made several attempts at achieving civil rights after the Black Community had done so in 1965. But, when they organized and demonstrated, leaders of the community whose names got into the newspapers were often fired from their jobs, even kicked out of their apartments. Homosexuals had no Civil Rights under the law. 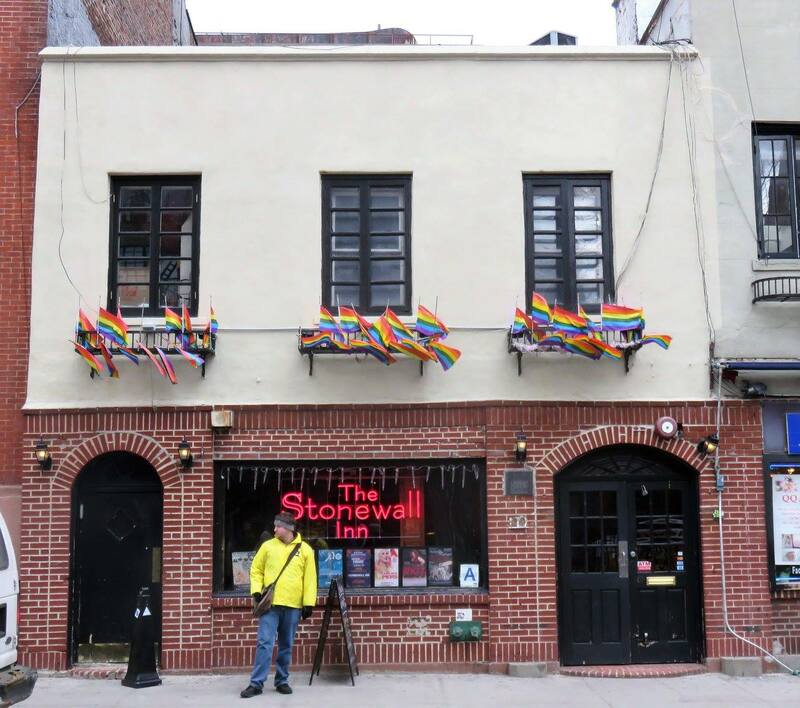 The Stonewall Inn was a place in which they could socialize and dance as themselves. The fuse that incited the events was a raid by federal and New York City agents looking to close down the bar"
--Macdougal Street, Cafe Wha and Minetta Tavern. From the moment we entered Macdougal Street I was charmed. It had the look of 1960's San Francisco with Hookah shops, tiny places that were just doors at the bottom of stairs like the Rabbit Club (black door in the pics below), unique eating places, crazy signs and of course Cafe Wha! Bob Dylan, Jimi Hendrix, Bruce Springsteen, Woody Allen, Lenny Bruce, Bill Cosby and Richard Pryor all started out here. In fact the side door is painted in honour of Hendrix. Another - Minetta Tavern - looked pretty rundown from the outside, but the website shows a wonderful interior, so who knows. It opened in 1937 and was named after the Minetta Brook, which ran southwest from 23rd Street to the Hudson River. It was the place to hangout for unknown artists of the time such as Ernest Hemingway, Ezra Pound, Eugene O'Neill, E. E. Cummings, Dylan Thomas, and Joe Gould, as well as by various writers, poets, and pugilists. --Hess Triangle! When the city moved to appropriate some land, one man fought back. The city won, but his heirs discovered the city's survey missed a tiny corner of the plot - about 50 square inches. They refused to give it to the city. This small triangle set in the concrete sidewalk right in front of the entrance to a corner store was claimed. They actually put in this plaque and a fence around it. The fence is now gone but the square is still there. Left - Hess 50 inch square, Centre - Street with 2 names, Right - Theatre tucked on a back street. --Some streets in NYC actually have two names and two sign posts. The street signs also come in three colours. I'm hoping I have this right. Green ones are the regular signs. Brown indicates a historic area. Black is a sign you're in one of the oldest historic areas (I did not see any of these). In our walk we only saw brown and green. Again, I need to double check to make sure I have the colours right. --Broadway, Off-Broadway and Off Off Broadway - The definitions of what these terms mean have changed in recent years as all theatres in Manhattan want to be able to say they offer Broadway plays. It is now defined by the seating of the theatre. Broadway means they have 500 or more seats. Off Broadway means the have over 100 seats. Off Off Broadway means they have 100 or less seats. -Where are the bodies buried? 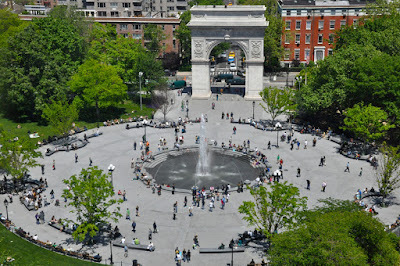 We ended our tour at Washington Square Park under the arch. What is not mentioned in most of the history articles I looked at is that was once was a graveyard. Renee of course shared this juicy tidbit with us. I wonder how many hanging out in the park know? "It remained farmland until April 1797, when the Common Council of New York purchased the fields to the east of the Minetta (which were not yet within city limits) for a new potter's field, or public burial ground. It was used mainly for burying unknown or indigent people when they died. But when New York went through yellow fever epidemics in the early 19th century, most of those who died from yellow fever were also buried here, safely away from town, as a hygienic measure... the cemetery was closed in 1825. 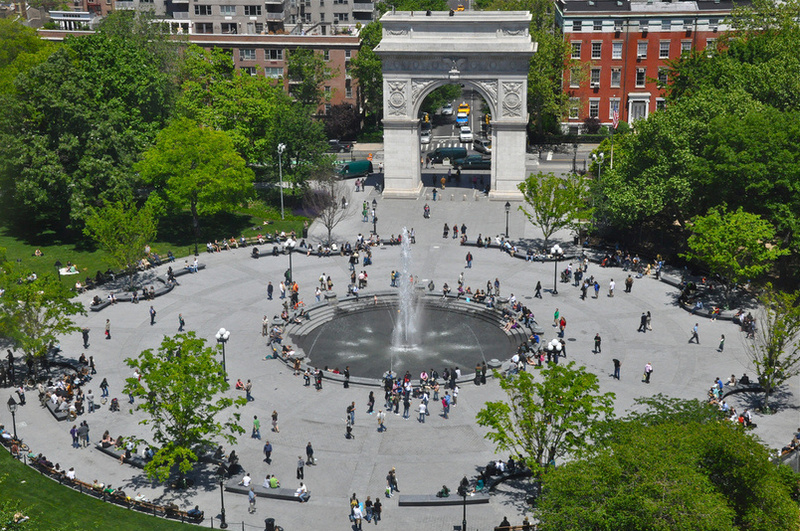 To this day, the remains of more than 20,000 bodies rest under Washington Square. Excavations have found tombstones under the park dating as far back as 1799." 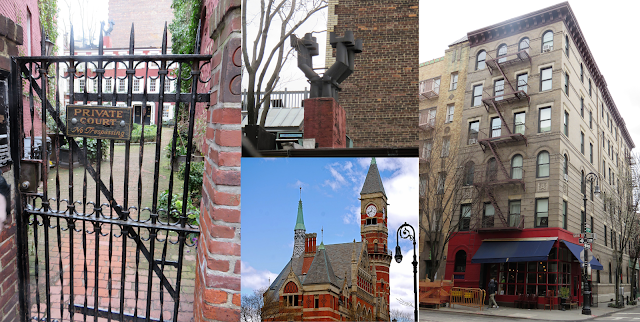 This is only a very small offering from what was an information packed walk covering Greenwich Village from every angle you could wish for. It's hard to remember all the history notes in particular. 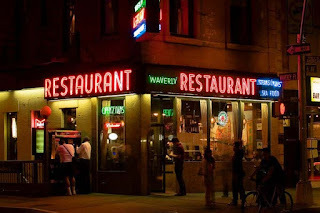 When it was over I was chilled to the bone so stopped into the small restaurant that was our starting point - The Waverly Restaurant - for a hot sandwich and bowl of soup. This is a typical old cafe with 5-6 page menu offering a bit of everything and filled with locals. I had hoped that meant great food, but alas it was very average. However it was at the right place at the right time and I left warmed just a bit. The long hours in the wind chilled me completely, so I headed back to my Airbnb and jumped into a tub full of water as hot as I could make it. E-reader in hand, I lounged for quite a while. After, I ended my day ensconced in my PJ's with a good book under a comforter. I love holidays.